Setup creator software produce executable (EXE) file from existing windows installer MSI files to easily install on various laptop, desktop and notebook computer. 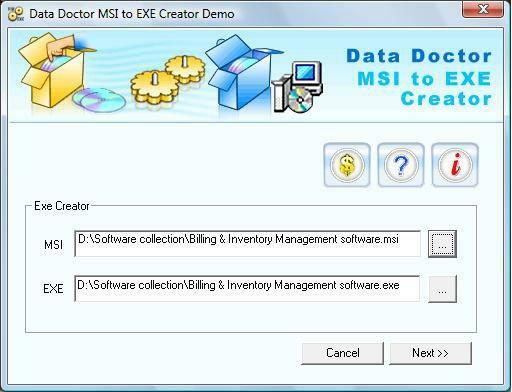 MSI to EXE convertor application entirely convert Microsoft .NET framework installer MSI package to EXE file without modify the functionality, behavior and attributes. Generated EXE can be saved at user specified location and support different windows operating system including Vista. ...... at laptop, desktop or notebook computer. Professional setup builder application does not requires any special technical knowledge and available with inbuilt step by step EXE creator help option. MSI to EXE setup generator software supports various Microsoft windows operating system edition including 98, 2000, NT, ME, XP and all available version of Vista. You have no need to purchase any other setup builder application because it is best EXE creator software compare to available other software in market with low cost and user friendly architecture. * MSI Setup to EXE Creator convert Microsoft .NET framework package to executable (EXE) file format. Create .EXE (executable) file from .MSI (windows installer) file. Create a native Windows EXE to launch your Java application! Qweas is providing links to MSI Setup to EXE Creator 2.0.1.5 as a courtesy, and makes no representations regarding MSI Setup to EXE Creator or any other applications or any information related thereto. Any questions, complaints or claims regarding this application MSI Setup to EXE Creator 2.0.1.5 must be directed to the appropriate software vendor. You may click the publisher link of MSI Setup to EXE Creator on the top of this page to get more details about the vendor.